L.S.C. Engineering Group is one of the largest engineering consultancies in Luxembourg and regroups several firms. We work together and combine our skills in order to meet the market requirements in construction, civil engineering and land use planning. In the light of the great responsibilities in our business sector, we are committed to being a responsible company. The Group is developing its offer to respond to sustainable construction challenges. By joining IMS and participating in their activities, L.S.C. wants to share experience in terms of sustainability and CSR approach. 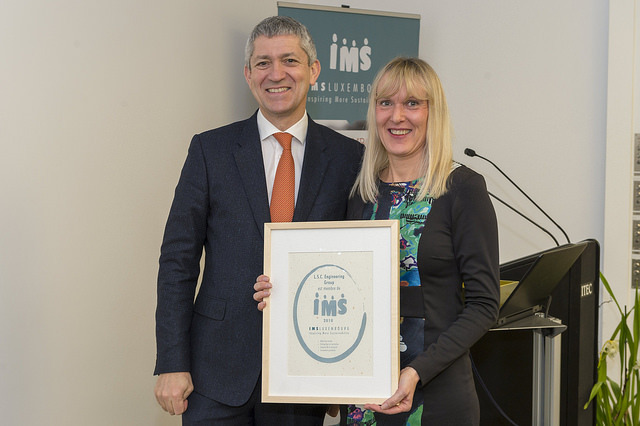 In addition, the IMS community allows us to learn about and share good practices, inspiring sustainable models and participate in many actions. Ethical and human values have always governed our firms. Now, the CSR approach is driving our corporate culture and is also integrated in our strategy and management system. The Group’s CSR policy is presented in our Ethical Charter for each company and its employees. The Social aspect is very important for us because the know-how of employees is the key of our services. Their well-being and health are the main factors that we focus on. Similarly, the new talents recruitment, based on non-discrimination while promoting diversity, is also criteria of our CSR policy. Concerning our governance, 90% of the Group’s shareholders are salaried partners. Each of them actually works in our companies. In this way, the strategic and financial objectives are realist because they are connected to the reality of work. We try also to collaborate with our stakeholders (municipalities, IMS, Verkéiersverbond, INDR, MLQE etc.) to act in different topics. For environmental area, we encourage our firms to adopt a responsible environmental management (separating waste, GHG emissions reduction, responsible purchasing etc.). Another aspect of our involvement is about our role in the sustainable construction. Thus we propose services including environmental concerns for all types of customers. We have employed a CSR manager full time in order to apply our CSR policy. Among many actions, we have recently developed a well-being survey to personalise our questions and focus on the main expectations of our employees. A specific team work was created to study all proposals of this survey. We are also looking for better mobility solutions. This is a common problem for Luxembourg employees. We are working with the local councils and Verkéiersverbond to find suitable solutions. In the same way, company cars for car sharing are available. The ESR label is another way to improve our CSR approach. It allows us to do our self-assessment in order to take right decisions. L.S.C Engineering Group web site is under construction. You can visit the web sites of their firms here.